A view of Vauxhall Gardens in the mid-1700s. There can be little doubt that Vauxhall Gardens was one of eighteenth-century London’s most successful entertainment venues. While there are no precise records of the numbers of people who visited the Gardens, references drawn from several contemporary sources suggest that it must have been tens or even hundreds of thousands a year. An edition of The Scots Magazine from 1739 noted that entrance to the Gardens cost a shilling and that “not less than one thousand shillings are received each evening”. The contemporary historian John Nichols offered a similar assessment, writing that “about an hundred nights make the season of Vauxhall; and the average of about one thousand persons per night is supposed to make a good season to the proprietors.” On special occasions such as the opening and closing nights of the season, the Gardens could expect to welcome several thousand guests in a single evening. The open-air banquet and sailing regatta hosted by the Duke and Duchess of Cumberland on 25th June 1781 for example, was said to have attracted a crowd of some ten thousand guests. These visitors would have expected to spend several hours in the Gardens and the proprietors soon realised that substantial profits could be made by selling refreshments to this captive market. During the first half of the century, catering operations at Vauxhall grew from a simple stall selling quantities of cold beef and beer, to a full kitchen and waiting staff capable of serving meals to guests scattered across several onsite dining locations. The menu was kept relatively simple, as both a nod to the fashionable taste for faux rusticity and a practical means of accommodating the difficulties of catering for an unpredictable number of guests at short-notice. Cold meats, salads and cheeses made up the majority of the savoury dishes on offer, with a selection of pastries, cakes and custards being available to follow. To drink, guests could choose anything from eye-wateringly expensive champagnes to more reassuringly English refreshments, such as mugs of beer and cider. Surprisingly, the popularity of the Gardens as a dining venue does not appear to have been diminished by the owners’ habit of charging extortionately high prices for small portions and low quality wines. 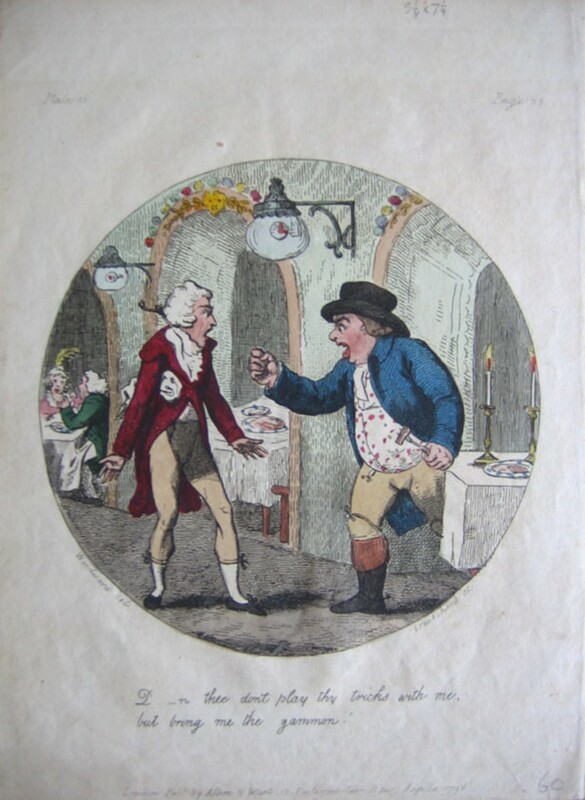 Indeed, the prevalence of caricature prints making light of the puny plates of sliced ham, or the huge bills that could be quickly run up in the Gardens restaurants, suggest that Londoners embraced this rip-off as something of an in-joke and a barometer of metropolitan urbanity. 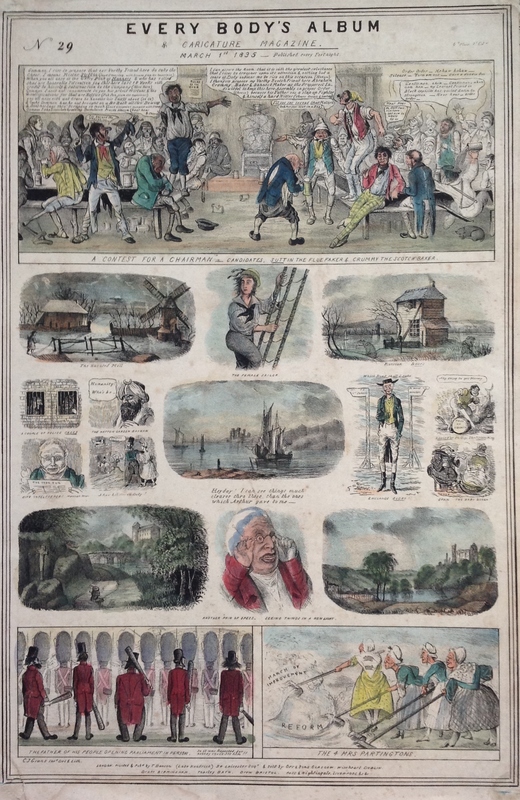 Prints such as Cruikshank and Woodward’s A County Farmer & Waiter at Vauxhall (1796) clearly imply that being caught out by the high prices at the Gardens was a mark of provincial incredulity. In splendid scenes we drink and eat! What we put in, than we put out? The only other reference to the toilets at Vauxhall comes from a caricature tentatively attributed to Henry Kingsbury and published by S.W. Fores. 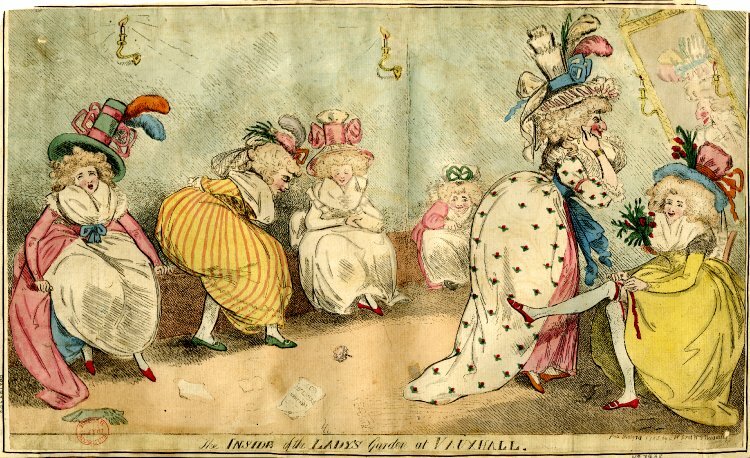 The Inside of the Lady’s Garden at Vauxhall (1788) purports to offer the viewer the opportunity of taking a peak inside the ladies toilets in the Gardens. We have no way of knowing whether the drawing is accurate, but it seems safe to assume that it had to be realistic enough to appear credible and therefore offers us an reasonable approximation of what the “ordinary house” may have looked like. It consists of a small windowless room, lit by candlelight, in which several women are using a communal latrine while others attend to their makeup and clothing. On the floor around them are pages torn from an essay by Dr Leake, the famous purveyor of pills for venereal disease, which are being used as toilet paper. 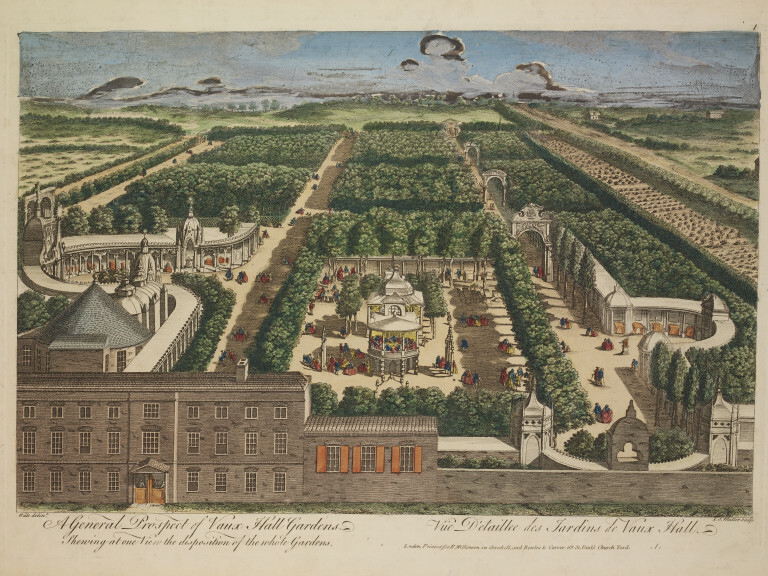 Their presence, along with the louche appearance of the ladies themselves, alludes to the slightly seedy reputation the Gardens had managed to acquire by the late eighteenth-century. Prostitutes were said to regularly ply their trade along the poorly-lit walks of Vauxhall and the management had to tread a fine line between respectability and ensuring their guests enjoyed themselves. They therefore seem to have adopted an informal policy of tolerating vice, so long as it remained discreet and by the end of the century the Gardens had become a noted haunt of prostitutes, homosexuals and cross-dressers. 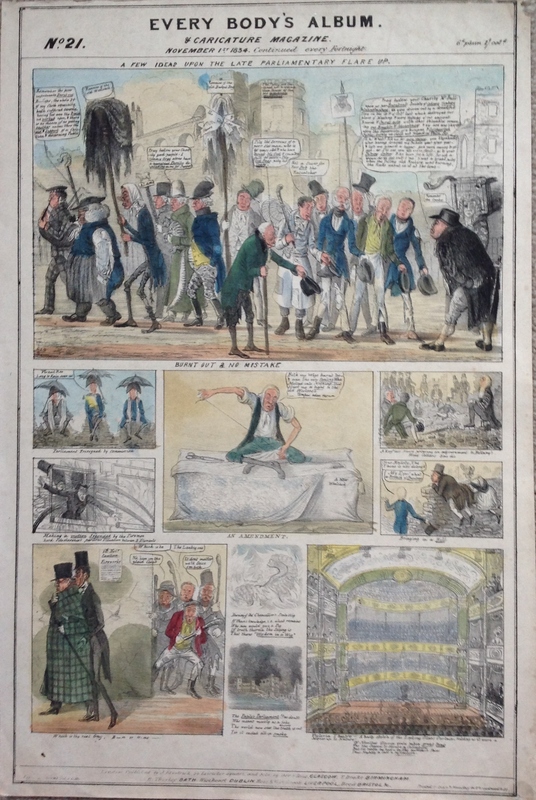 Caricature magazines first appeared in Britain during the mid-1820s and were firmly embedded within popular print culture by the end of the decade. The magazine of the Georgian era was not the substantial glossy publications that modern readers are familiar with, but rather single sheets of printed paper covered with small caricature vignettes. 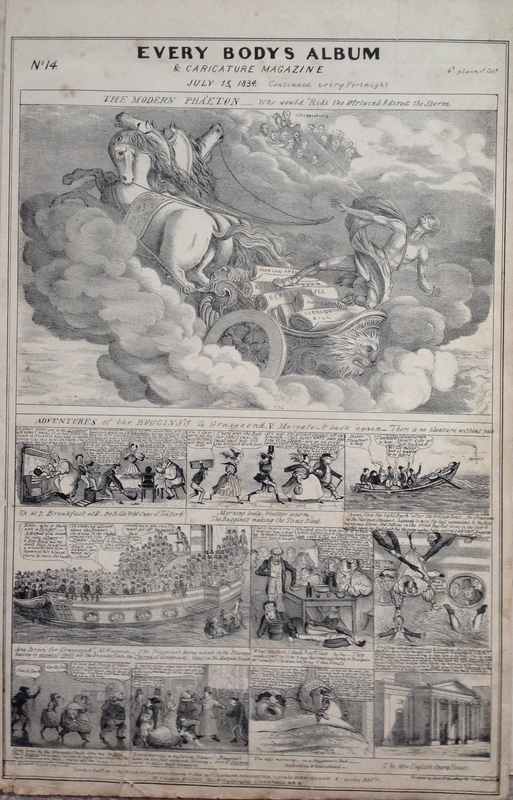 The array of images on offer in each edition was undoubtedly a key part of their success, as the typical caricature magazine offered thrifty Georgian consumers the option of buying a dozen or more smaller pictures for the same price as a single traditional caricature print. Evidence of circulation and consumption rates is sketchy, but if the publishers own claims are to be believed then successful magazines, such as Thomas McLean’s Looking Glass (1830 – 1839) and Gilbert Beckett’s Figaro in London (1831 – 1839), were able to build up substantial national followings which rivaled those of the major metropolitan newspapers. The caricaturist C.J. Grant founded his own caricature magazine in 1834. 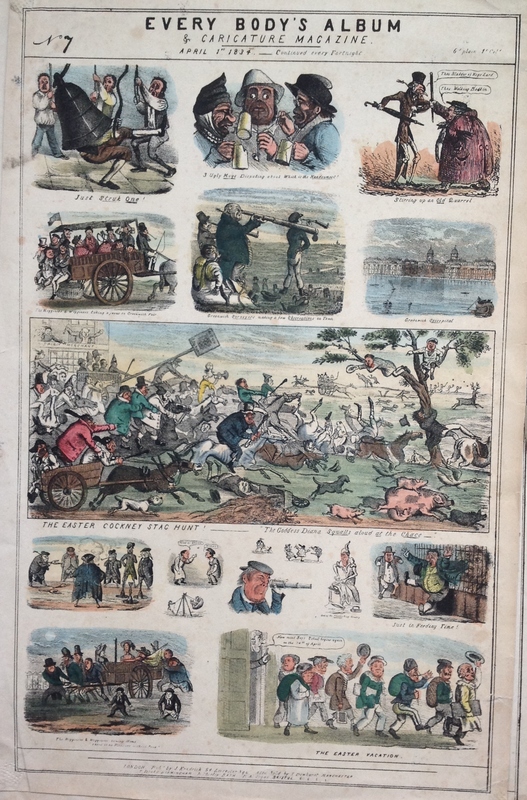 Every Body’s Album & Caricature Magazine was published fortnightly and ran for a total of 39 editions before finally folding in 1835. The first 24 sheets were published by John Kendrick and printed by Dean & Munday of Threadneedle Street, after which Thomas Dawson seems to have assumed responsibility for financing the project. Each edition sold for a six pence, or a shilling if the customer wished to have colouring added. Dawson claimed the magazine achieved a circulation of 39,000 copies which, while still only about half the numbers Figaro in London is said to have achieved, constituted a substantial readership. The list of provincial retailers which appears at the foot of each edition also suggests that Grant’s audience extended right across England and as far afield as Dublin and Glasgow. Every Body’s Album was different in both style and content to the penny political prints with which Grant’s name had previously been associated. The caricatures predominantly dealt with more whimsical social subjects, such as manners, fashion, and new technologies, as well as trading in the usual jokes at the expense of lawyers, doctors, priests and foreigners. And while political subjects still loomed large in Grant’s oeuvre, they were often presented in a far less confrontational style that presumably reflected the moderate tastes of the Album’s middle-class followers. In January 1835 Grant produced an expanded variant edition of his magazine under the title Pictorial Companion to the Newspapers and Every Body’s Album. This new publication essentially consisted of two regular caricature magazines printed onto a single sheet of paper, which was folded in half and read like a conventional newspaper. It seems as though Grant and Dawson may have hoped that this larger and more expensive product would supersede the single-sheet edition of Every Body’s Album, as two weeks after the Pictorial Companion was published, a note appeared at the foot of issue number 25 of the Album to inform readers that in future it would “assume more the character of a periodical than hitherto”. However, sales evidently failed to live up to expectations because publication of the Pictorial Companion ceased after just one issue and the the Album retained its usual format until it too was brought to an abrupt halt later that year.